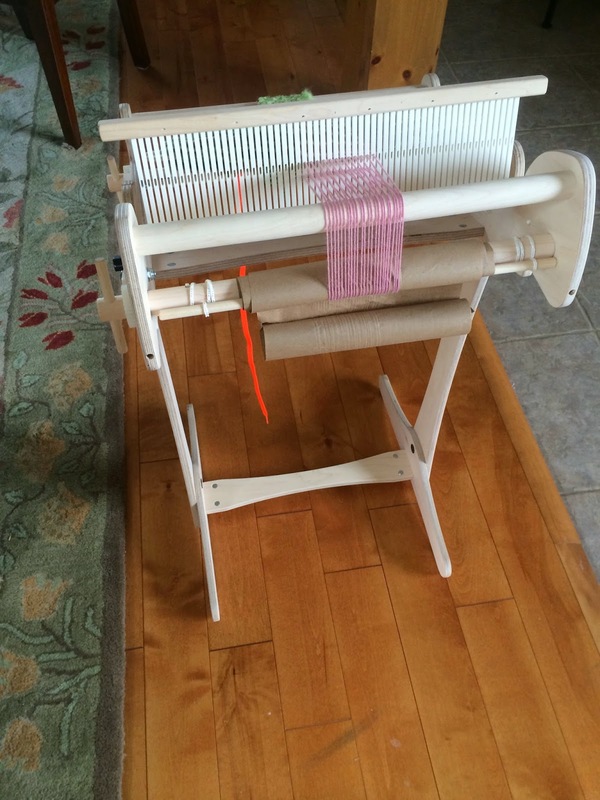 Last Wednesday (week ago) I got my Cricket Loom. 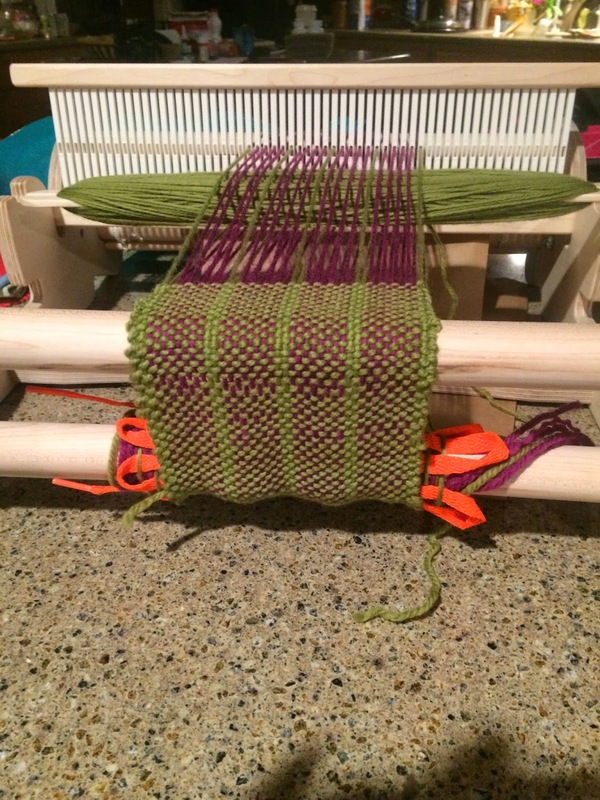 I decided on the 15" loom so I could have the opportunity to make place mats and table runners. Of course, like everyone else I started with scarves. I, also, got the stand. It made it easier for me, but it's certainly not necessary. Getting started - the bright orange is a leader! 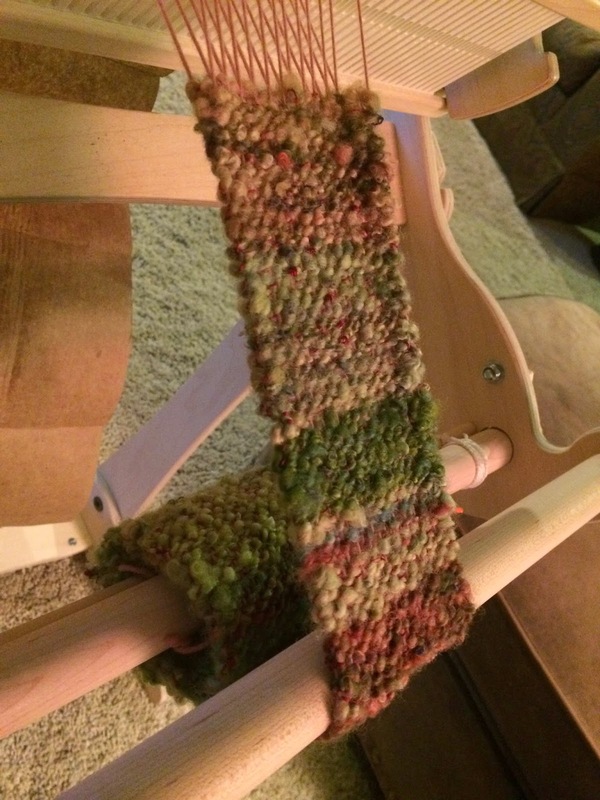 The loom came with two balls of yarn for your first item and learning how to use it. I loved it! 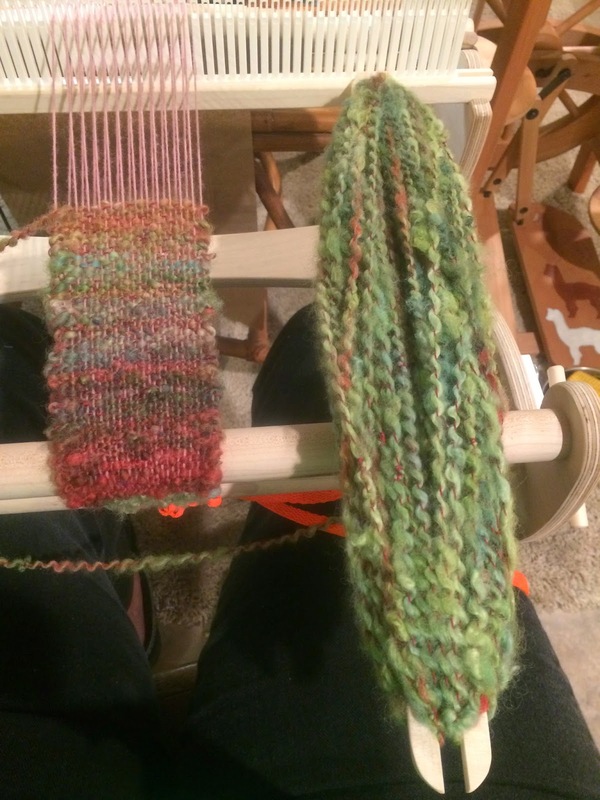 Not the yarn or the first piece, but the weaving! 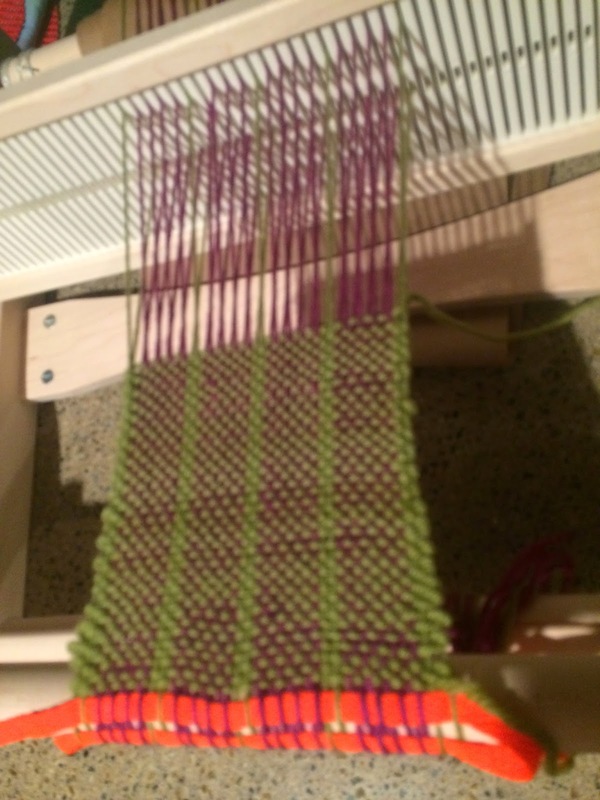 Warping this loom is a breeze compared to large looms and my second piece wasn't far behind the first. 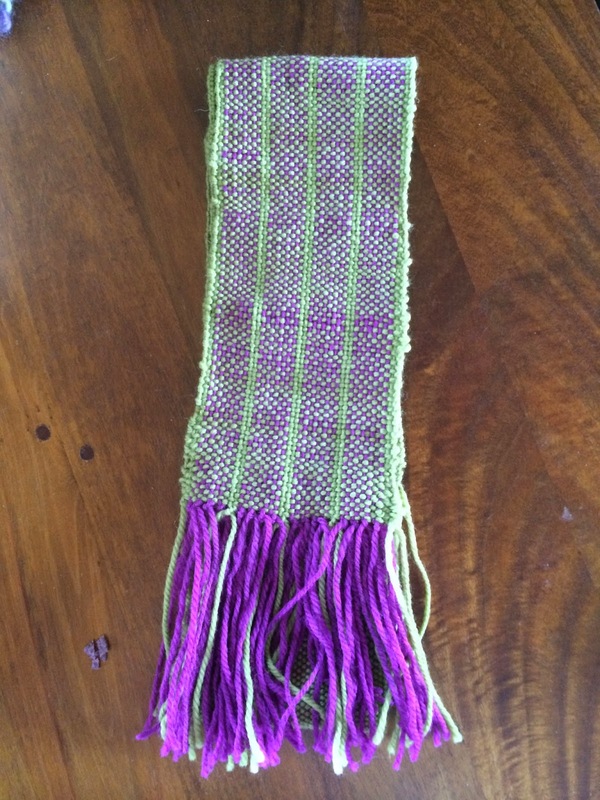 Finished weaving, but still needs to be trimmed and washed! 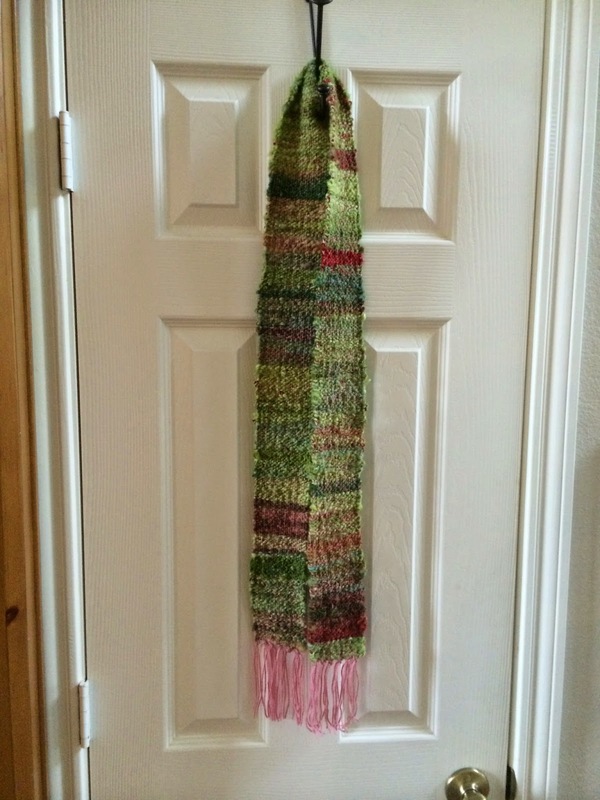 My second piece was warped with a light weight yarn and the weft was a wonderful hand spun art yarn that I got the very first time I visited WC Mercantile in Navasota, TX. I've now taken classes from and with the Diana North of Feisty Fenn Fibers and her yarns are wonderful. You can find her yarns in her Etsy Shop and at WC Mercantile. 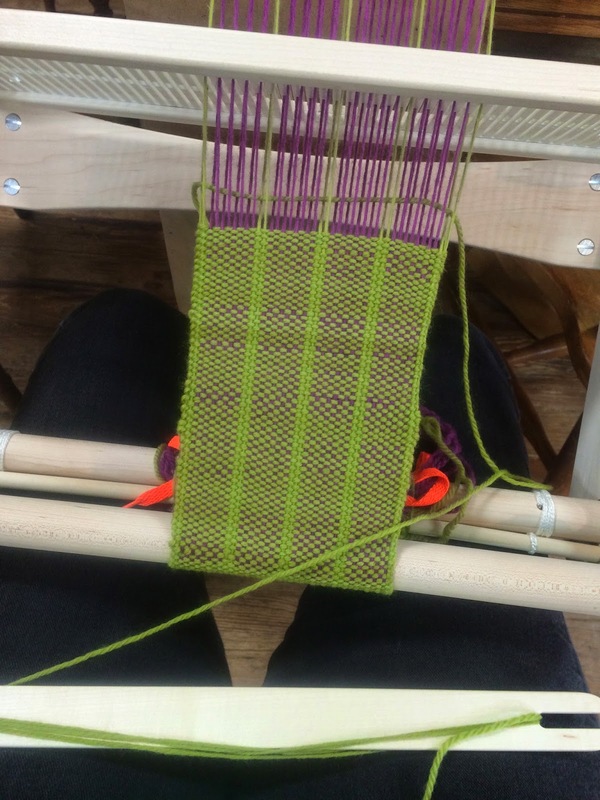 If you're interested you can find the Cricket Loom at my favorite yarn shop already mentioned WC Mercantile, but then you can't mention a good thing too many times! If you knit, crochet, spin or weave or just love to see beautiful yarns and fibers you really need to pay them a visit! Second piece started and the gorgeous yarn! 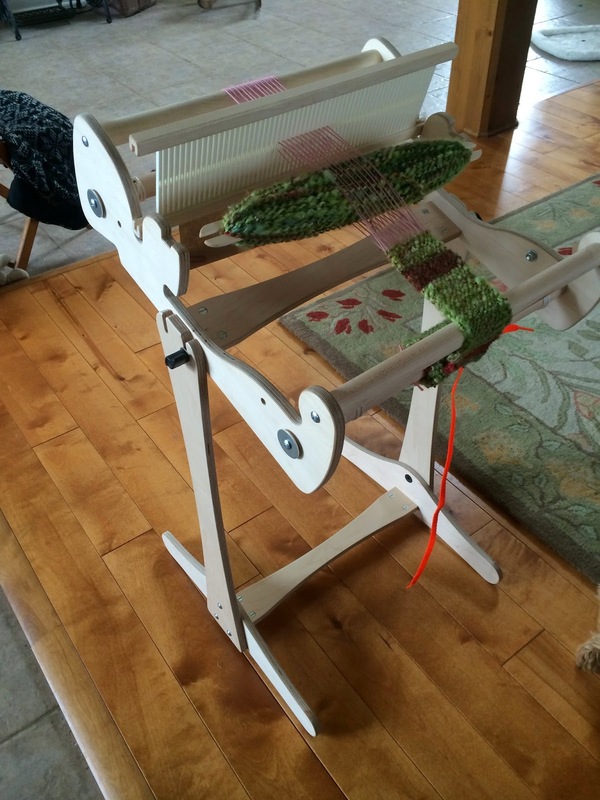 Loom on stand from front. Loom on stand from the back. Complete with fringe all tied. Look at those stripes! And, today, I've put my baker's hat on. So far I've failed to follow the simplest directions and then had to jump in and improvise. The baking time is 15 minutes longer than recipe called for and I forgot to take pictures through the process! It would have made for a good laugh. My mom was such an incredible cook and baker and I'm just not! So far, I forgot to swirl the cinnamon sugar mixture that was layered 1/2 way in and on top. I pulled them (2 loaf pans) out and broke through the wonderful crust and swirled! The sugar mixture was just sitting on top - I had to do something! ;) Amazingly they raised right back up with a beautiful top, but now the baking time!. Recipe said 45-50 minutes and we're on 60+ minutes and they're still not done. But they smell wonderful and look great. I, also, added a splash of vanilla to one pan and used parchment paper rather than greasing the pans. I need new pans and thought this might help. If I like the finished product, I will buy new pans. The bread is out and cooled and out of the pans. The parchment paper worked beautifully - no pans to clean and browned to perfection. 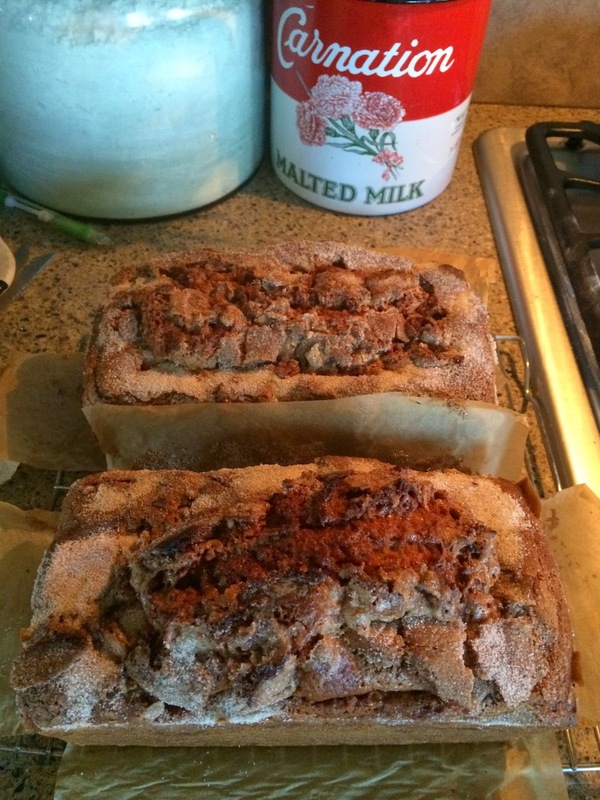 The bread is fab and would be a great breakfast/brunch bread or, for me, any time bread! The only change I would make is to swirl it with a knife the way the directions said! hahaha I do like the vanilla, but haven't tasted the other one to know whether it's important or not. I think vanilla helps almost everything, so I would probably include it. This has been a crazy busy week with new fencing installed around the boys (alpaca) area and so I haven't created much - hope to warp the loom later today! Until next time - happy creating!